Perhaps the music industry's standout success of 2010 has been Slash's awesome, guest-star laden solo album. The record was not only crammed wall-to-wall with face-melting licks and galaxy-sized solos, but it also featured an all-star cast of sticksmen - Dave Grohl, Josh Freese and Steven Adler to name but three. All of which meant that whoever took the job of Slash's touring drummer would have the task of laying down tracks by some of the greatest drummers of the last 30 years night after night. Step forward Alice Cooper sticksman Brent Fitz. We caught up with Brent to get the inside word on backing a bona fide rock legend. How did you get the Slash gig? "I was playing in LA with Bruce Kulick (ex Kiss) and Gene Simmons' son Nick. We had two days off and a friend called me to say that Slash was looking for a drummer and I just happened to be in town so my friend put us in touch. By the end of that day Slash had called me. I was just in the right place at the right time." In the set you're playing parts by drummers like Josh Freese, Dave Grohl, Matt Sorum and Steven Adler. How have you found that? "The Josh Freese stuff is pretty killer. I always referenced a couple of guys in my style. I've always liked guys like Jeff Porcaro, Tommy Lee, Tommy Aldridge, but now I seem to be stealing licks from Josh Freese!" Does the variety of the tracks keep the gig interesting? 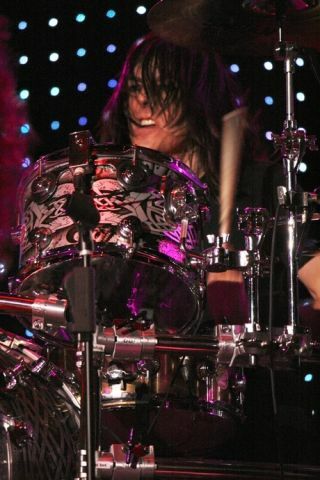 "I'm attracted to the Steven Adler groove. He was definitely an important part of the [Guns N' Roses] puzzle. In playing these songs I don't have much liberty in changing the parts. If I'm playing a Guns N' Roses song I want to play the song. I pride myself in getting all those cool fills in. I related to the new [Slash solo] album a lot because it's got a very AC/DC groove on a lot of the drum parts." Are there any of the parts that are particularly difficult to pull off? "There's a song called 'Nothing To Say' on the new album that has some double kick in it. It's a little bit out of my element so I've really enjoyed that challenge. I come from the John Bonham single kick school of drumming. I had to call my friend Jeremy from Five Finger Death Punch and I said 'Dude, you've got to help me, I need to do this at 170bmp for 24 bars'. He got me up to speed really quick. I'm not afraid to go get some help." Is getting the right sound of each song in the set a challenge? "We were listening to 'Rocket Queen' the other day and Slash was saying that for the time period it's got a pretty good drum sound. And the same as playing the right part, with the gig I want to get the right sound. That really big rock sound has to be there. I don't play my snare real tight. It needs to sound like AC/DC. And I use triggers, just to tuck a sample in underneath. Me and John Douglas my tech spent a lot of time checking out the records and getting the right sound, down to tuning and making sure the toms sound right. The music requires a big sound." What set-up are you playing on the tour? "Forever I've used a 26" kick but I've gone to 28". Two inches louder and two inches bigger. Actually the real reason is I went to see Abe Laboriel jrn with Paul McCartney and he was making Beatles songs sound so amazing with a huge kick drum. If he can rock out, I can too!" What's coming up for you after the tour? "We're doing festivals in Europe until the end of July. We're going to Japan, Australia, China then the States later in the year. I think Slash has been very happy that the response has been great. We're not party guys like we were 20 years ago so we're just here for the music."